Frameless Glass Doors UK are designers, manufacturers and national installers of a patented frameless glass door system. 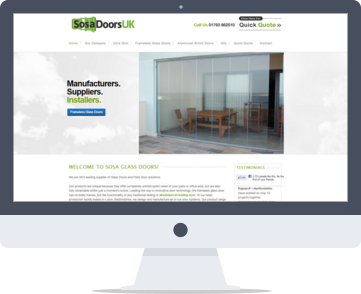 E Sosa Doors are designers, manufacturers and national installers of a patented frameless glass door system. They required a completely custom built website to showcase all of their products along with an ongoing SEO campaign to drive increased traffic to their website. All aspects of the website are optimised for lead generation.